Cork South Central Fianna Fáil TD Michael McGrath has said the government needs to press ahead with the National Broadband Plan following confirmation that 75,000 homes and businesses in Cork are without high speed broadband – and in many cases any broadband at all – because of the government delays. 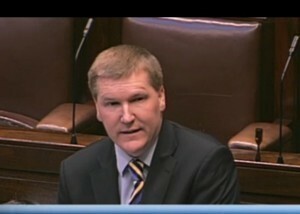 Deputy McGrath was commenting after receiving a parliamentary reply from the Minister for Communications, Denis Naughten which shows that there are 270,000 premises (including residential and business premises) in Cork, including 75,000 who will completely rely on the State-led intervention for access to high quality broadband internet. Deputy McGrath commented, “I am receiving regular complaints from constituents about the lack of good quality broadband and in some cases any broadband at all. This often includes people who are actually living close to a town centre. They have been badly let down by the government. “The delivery of the National Broadband Plan is a sorry tale of delays and ineptitude by Fine Gael in office. This Plan was announced in the early days of the last Fine Gael government and was promised for completion by summer 2016. “The simple fact is that the Plan has not even started yet. To make matters worse, the contract hasn’t even been signed by the Government. “The net result of the delay in rolling out the National Broadband Plan is households and businesses not having access to the high speed broadband they need to keep up with the modern world. For people trying to work from home, this situation is intolerable. “I am imploring the Minister for Communications, Denis Naughten to get on with the job of awarding the contract and letting the service providers get on with the job of rolling out broadband to these 75,000 premises across Cork. “The time has come for action when it comes to the National Broadband Plan. Too many Cork people are fed up waiting for progress – it’s now a critical piece of infrastructure and should be treated as such by the Government,” concluded McGrath.